Kalabaka, Greece. 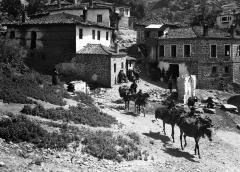 Donkey train leaving the town fountain in front of houses. In rural towns, there were often public fountains from which residents would draw the water necessary for everyday life.